The Tar Bar’l takes place in Allendale every year on New Year’s Eve, 31st December. Also known as the Tar Barl, Bah'l, Bahl, and Baal - the spellings are various as it is a contraction of 'barrel' - the Tar Bar’l is perhaps one of the most spectacular examples of fire festivals still practiced today. This sizzling ceremony has been celebrated for at least 160 years, though some believe it began in the Middle Ages. Key figures in this tradition are the guisers, forty-five local men who carry whiskey barrels filled with burning hot tar in a colourful procession through the town. To become a guiser, each man must have been born in the Allen Valleys - many have inherited their status from previous generations. They wear colourful fancy dress and soot-blackened faces. Seen as a feat of strength and daring, only men can become guisers. It is said just one woman has ever taken part in the tradition. Local lass Miss Vesta Peart was permitted to carry one of the barrels in the mid-1950s, as a thank you for creating a large number of costumes for the guisers. Many of these costumes are still worn today. Locals and visitors alike flock to the town for this night of revelry as music and dancing fill the streets. From 11pm, the crowds gather in the town centre to see the guisers called upon to do their duty. At 11:30pm, the torches are lit and the barrels ignited. 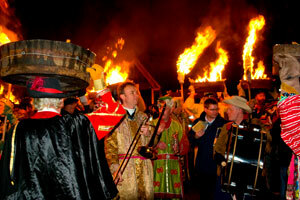 Each guiser lifts the flaming barrels up onto the top of their heads and fall in behind the band. At midnight, they arrive at the Bar’l fire in the town centre. The barrels are then used to ignite this ceremonial bonfire, as everyone shouts “Be damned to he who throws last”. Ross Beedle, a photographer who captured the celebrations in 2011, said: “The guisers’ costumes get better every year. The event is spectacular. The tradition of celebrating the end of the old year and start of the new with fire festivals is not unique to Northumberland. The origins of these festivals are unclear, with claims for both pagan and Christian roots. Similar traditions can be found around the UK, particularly in Scotland such as Up Helly Aa on the Shetland isles, which originated slightly later than the Tar Bar’l in the 1880s. A brilliant way to see out the old year and welcome in the new!